The famous mosaic floor "Beware of the dog"
ONE-HOUR VISIT OF POMPEII WITH YOUR OWN PRIVATE GUIDE. Enjoy this one-hour private tour with a professional English-speaking guide in the ancient Pompeii. Today Pompeii is visited every year by more than 2,5 million people and obviously You'll find crowd everywhere. 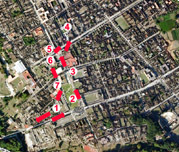 But in that one hour You'll see with Your private guide (only for You) the most important highlights of Pompeii in the SEVEN STEPS indicated on the map of the ruins. The Temple of Apollo: it was built during the III century b.C. and it is one the most ancient religious buildings in Pompeii. Forum: it was the focal center of the economical, political and religious life of the town. The Food Market: it was used as a covered-in food market and today the plaster casts of people are exhibited. The Bath houses: Well-preserved example of Roman Baths. Grain Stores: Originally it was a market where the people of Pompei could buy cereals, herbs and dried pulses. Now it is used for storing archaeological findings such as plaster casts, statues and other artifacts. THIS ONE-HOUR TOUR IN POMPEII RUINS COSTS EUROS 100. THE ENTRANCE FEE IS NOT INCLUDED.